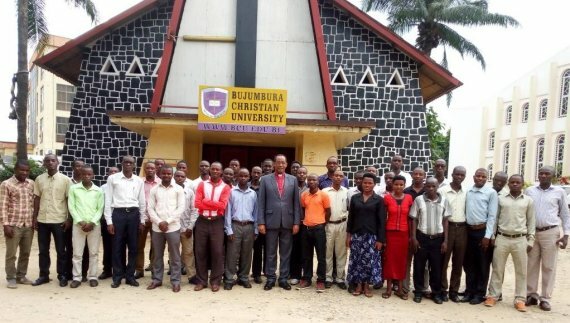 The Province of the Anglican Church of Burundi established the University in 2014 with a Faculty of Pastoral Theology. The first intake of students commenced their studies in 2015. The first BA degrees in Pastoral Theology were awarded in 2018. The purpose of the University as an academic institution to equip and empower a new generation of leaders for Christian ministry that will benefit the Church and the Nation. As a Christian university BCU has an opportunity to play a major role in the spiritual, intellectual and socio-economic development of Burundi. To that end the University aims to offer carefully designed courses that stimulate and challenge students to reach their full potential. National and international lecturers contribute to the enhancement of learning. Through seminars, meetings and conferences students have an opportunity to engage with modern scholarship and research. Placements and field work ground academic study in individual and national life. BCU is seeking to develop a warm and vibrant Christian community that serves, studies, worships and prays together. It welcomes diversity and is committed to mutual understanding, cooperation and unity. Expansion of faculties and facilities will enable BCU to continue to achieve its goals and vision in the future.